My toddler asked me to make some healthy carrot cake cupcakes (“Let’s make cupcakes, Mommy! I no like cookies. Carrot cupcakes!”). I was stoked that she was interested in helping me bake so we got to work. Only problem was that we had all the ingredients except enough eggs (our recipe takes an entire dozen!) and we wanted to keep our baking experience spontaneous (without a trip to the store)…so we decided to improvise! If you’ve ever cooked with coconut flour, you know how risky it can be to improvise. Thankfully, it worked out for us and these muffins are SUPER AWESOME! Get out 2 big bowls. 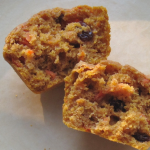 Mix the coconut flour and baking powder in one and all the other ingredients in the other bowl (it is easiest to add the chunky ingredients last–nuts, raisins & carrot shreds). Grease muffin pans with butter and preheat oven to 400 degrees. Fill muffin cups about 3/4 of the way with batter and bake for 15-17 mins. Tops should be slightly darker, but inside really moist. Makes 12 muffins. Optionally, you can top these muffins with cream cheese or cream cheese sweetened with vanilla stevia (to taste). 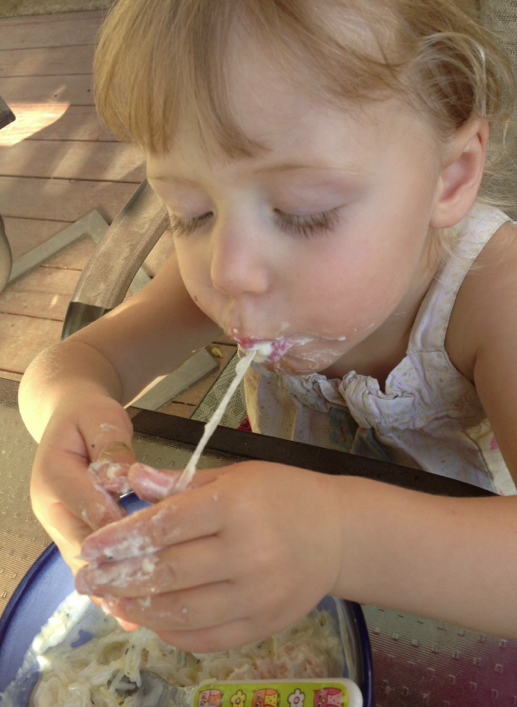 Or smear some grass-fed butter on there. Otherwise, they are FABULOUS on their own and are gluten-free-grain-free & dairy-free. My daughter literally ate 4 of them in one day. 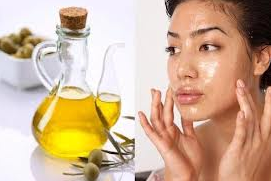 Wash your face with oil: WTF?! 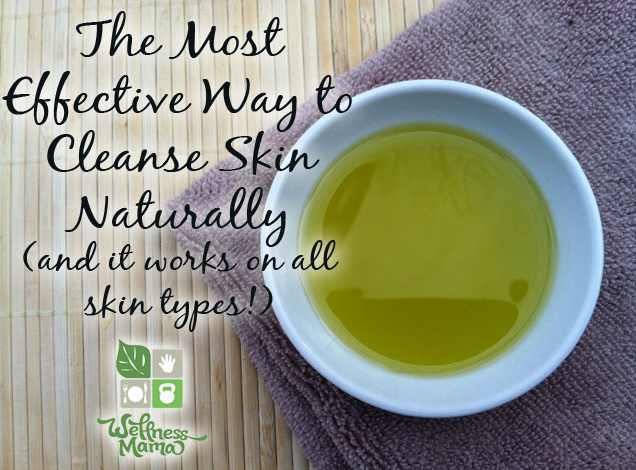 If you’ve never heard of the oil cleansing method (OCM), you’re not alone. Most of us use some variation of soap, cleanser, toner…yet after reading up on OCM, it sounded just weird enough to be awesome. I love the idea of using simple, edible and inexpensive ingredients to care for my skin, so I decided to give it a try. I’ve been using the OCM for about 6 weeks now and not only does my skin feel clean afterward, it feels soft & supple (and I didn’t break out at all or feel like my face was greasy). Choose an edible carrier oil that you can combine with castor oil (the primary cleanser: yes, castor oil has superhero cleansing powers). Options are olive oil, sesame oil, grapeseed oil, sunflower oil, or coconut oil. Go with high quality, organic oils (it is going on your face after all). And remember that you can use other oils besides sunflower seed oil. Squirt about a quarter size amount of oil into your palm and rub hands together, then massage oil gently into your facial skin. Get a soft washcloth wet in hot water and then squeeze out excess water. Apply to face like you are steaming the pores open for about 20 seconds. Remove once it cools and repeat a couple times. When you’re done steaming, gently wipe your skin (do NOT scrub the oil off). Rinse a couple times with warm water and finish with a cold splash. That’s it. Pretty simple process even with the whole “figuring out your personal blend” piece. I started with a really small amount of oil in a glass bowl because I didn’t want to waste oil if I didn’t like it. It was easy to adjust the oils this way until I found a combo that felt really nice to my skin (which happened pretty much right away). I know it sounds strange and is certainly different than what you’re used to, but I encourage you to give it a try. It’s actually easier, cheaper and better for the health of your skin than what you’re likely currently doing. 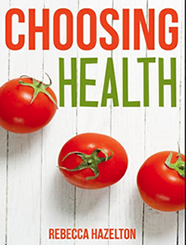 http://choosinghealthnow.com/wp-content/uploads/2016/05/apple.png 0 0 admin http://choosinghealthnow.com/wp-content/uploads/2016/05/apple.png admin2013-05-24 15:15:252013-05-24 15:15:25Wash your face with oil: WTF?! I have to share my latest culinary discovery: Shirataki Miracle Noodles. They are made from a water soluble fiber called glucomannan derived from the root of the Konjac plant (as well as several other names) and have been part of Chinese and Japanese cuisine for 2000 years. Why I had to try them? They are a grainless, soy-free noodle that add bulk and fiber to a meal without starch, sugar, or calories…and yet they truly give the illusion that you’re indulging in pasta. If you’re looking to convert to a lower starch or sugar diet, these noodles are perfect. Friggin’ tasty! 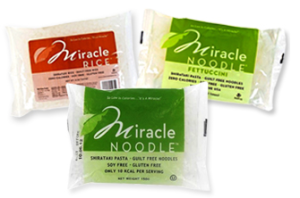 Lots of options available including fettuccini noodles, Orzo pasta, angel hair pasta, and Miracle rice. Substitute them in your favorite recipe or try them in my delicious seafood alfredo recipe! Sauté seafood blend on medium heat in a medium pan with butter. Cook for about 5 minutes (until seafood turns opaque) then stir in cream, spices and cheese. Reduce heat to low. In a small pot, boil 1.5 cups of water. Rinse noodles thoroughly for 15 seconds and then cook in boiling water for 2 minutes. Remove and lay on paper towel to dry (they don’t have to be completely dry before serving). Add noodles to seafood Alfredo and top with additional Parmesan if desired. 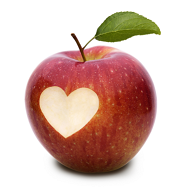 http://choosinghealthnow.com/wp-content/uploads/2016/05/apple.png 0 0 admin http://choosinghealthnow.com/wp-content/uploads/2016/05/apple.png admin2013-05-06 05:45:372013-05-06 05:45:37Seafood Alfredo with "angel hair pasta"